I finally made this card for the current Tuesday Trigger - Garden Glory. 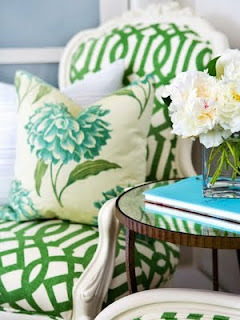 I was inspired by the flower in picture, the green pattern on the chair and the blue in the flower and the book. I used Wendy Vecchi Sketch Art Stamp set for the flower and an exclusive Studio Calico Kit Club stamp that is from Studio Calico and Hero Arts for the background. The sentiment is from Technique Tuesday. Thanks for taking a look! Beautiful, Donna! Love that big flower! What a cute card! Love those hexagon tiles you used!